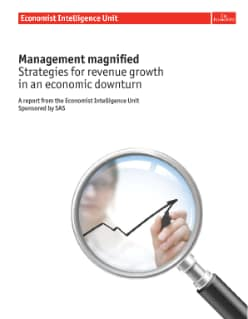 "Strategies for revenue growth in an economic downturn" is an Economist Intelligence Unit report sponsored by SAS. It is the second paper in a three-part series entitled Management Magnified aimed at helping managers find ways to guide their companies more effectively through troubled times. This paper looks at how growth is possible in an economic downturn, even one as severe as the current crisis, and how the financial health of a company at the outset will determine whether it can go on the offensive and use the downturn as a growth opportunity, or whether it will be forced to play defensively and risk losing market share. The paper concludes that a judicious mix of the two -- cutting costs in non-priority areas in order to use the savings to develop new products and enter new markets -- is the best way to ensure that a firm comes out of the crisis in better shape than it went in.